Regards about the KAGUYA's FAQ was collected. How long will KAGUYA be in operation (ie what is the mission life period)? And when will operations end? KAGUYA will operate for one year in nominal operations phase. After this year, we plan to extend the mission if KAGUYA has enough fuel to maintain the required orbit and altitude. When the fuel is depleted, KAGUYA will descend to the lunar surface – just as past lunar missions have. What is the data release plan for KAGUYA? One year after the end of the nominal operation phase (about two years after the launch), all KAGUYA products will be opened for public access online. During this one year data study period for instrument teams’ data research and validation / verification, sample data will be posted on the homepage for public outreach. How can I get the file of the KAGUYA mission logo? You can download the KAGUYA logo from the KAGUYA illustration page on the homepage. To use the KAGUA mission logo, please follow the site policy. How can I adjust the HDTV image of Earth observed from KAGUYA on October 1st, to fit my personal computer screen? Because the aspect ratio of the HDTV image is 16 x 9 and a standard screen aspect ratio is 4 x 3, the top and bottom of image are cut to suit standard screens. Selects the picture with the background of the "desktop" tub, and at display position selecting "indication on the center". Where can I see full high vision movies including "Earth-rise" captured by HDTV onboard KAGUYA? Full high vision movies by HDTV are used to educational purpose in schools without any charge. People who want to use full HD movies for lectures should contact to JAXA. In addition, JAXA also uses full HD movies in science museums and at the other JAXA's events to promote KAGUYA and JAXA activity as well as educational purpose. We hope you can see full HD movies at science museums, schools and mass media. 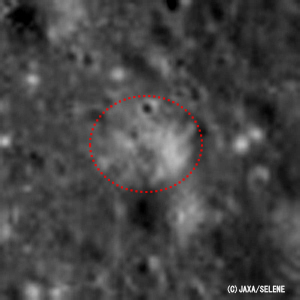 Is SELENE scheduled to observe the location of the Apollo landing sites and if the onboard cameras have the resolution to capture discernable images of the landing sites to find Apollo lunar rover, etc..
KAGUYA (SELENE) observes the entire lunar surface using mission instruments such as Terrain camera, multiband imager, etc. This means that KAGUYA provides images where Apollo were landed with 10 meter resolution of Terrain Camera. Since Apollo lander and rover were too small to detect with 10 meter resolution, it is difficult for us to provide discernable images of the landing sites of the Apollo. This still image is a snapshot from a high definition movie taken by the onboard high definition TV on November 19, 2007. 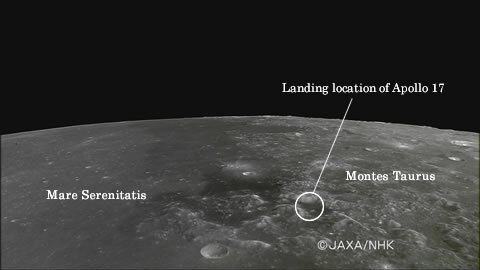 The still image shows the area around the landing site of the Apollo 17 (1972) (between "Monte Taurus" from north to south in the lower center.) The left side is "Mare Serenitatis". In addition, the Japan Aerospace Exploration Agency (JAXA) reported on the "halo" generated by the Apollo 15 lunar module engine exhaust plume that was detected in the data on Feb. 24, 2008 from Terrain Camera (TC) image. The enlarged image where the area of the potential "halo" exists. (left image: 1 square kilometer in size. The inside of the red circle includes the potential "halo"). 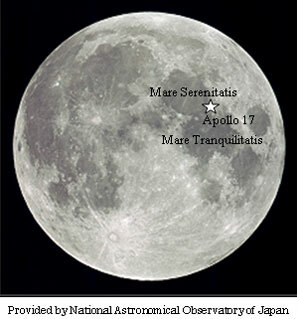 The reflectivity of the "halo" area became brighter than the original one by the Apollo 15 lunar module engine exhaust plume and the probable "halo" area was confirmed. In addition, if you have any questions about the JAXA and whole aerospace development, look at the "Frequently Asked Questions About JAXA" of the JAXA's website.